For the past four years, Matt Fronk has been at the forefront of developing the energy and battery storage technology segment at Eastman Business Park. One of the founders of the New York Battery and Energy Storage Technology (NY-BEST) consortium, Matt provided invaluable assistance in the development and construction of the BEST Test & Commercialization Center at EBP. He continues as one of EBP’s leading Energy Sector Business Development consultants, attracting advanced battery and energy storage companies to the infrastructure and pilot-to-scale facilities that are available at the Park. Those credentials, coupled with his years as a former General Motors Corp. executive in charge of the company’s global fuel cell technology development program, helped earn Matt an Engineer of Distinction Award presented recently by the Rochester Engineering Society. 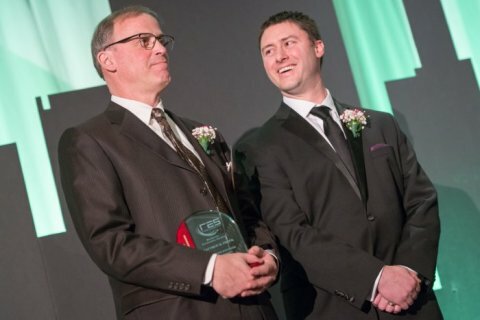 "I am humbled by the recognition the RES has given me as an Engineer of Distinction and look forward to continuing to support the region’s economy in the development of the Energy Sector at EBP,” Matt said of the award, given at the 114th Rochester Engineering gala for engineering achievement, leadership and community service. Matt is no stranger to engineering innovation. As long as he can remember, Matt longed for life’s “fast lane.” As a youth growing up near Schenectady, NY, he loved going to stock car races with his dad. In high school, he purchased a 1967 GTO which he is currently restoring. At Union College as an aspiring mechanical engineering, he was a race car mechanic, earning money at a local high performance shop to supplement his college tuition. Then, upon graduation, it was off to Rochester where he worked in GM’s emissions control systems unit at the company’s Rochester Products division. The company recognized his rising star status and in 1990, Matt accepted an offer to head the development of GM’s zero-emission hydrogen fuel cell program. In 20 years, the unit grew from a team of three to a global workforce of over 600 – including a program in Honeoye Falls, NY near Rochester, where a fleet of Chevy Equinoxes were being equipped with highly-advanced hydrogen fuel cell systems. That effort concluded in 2009, when Matt left GM and sought new frontiers. Today, as the EBP consultant for Matt Fronk & Associates, Matt is inspiring next generation companies to bring their fuel cell, battery and alternative energy technologies to the Park. Matt says his new role is a fundamental shift from the “gearhead” days of his youth. But he enjoys the challenge, nonetheless. “I think we’re making some pretty good progress,” he said. Congratulations Matt, on your achievements! EBP is glad to have him along for the ride.